The Topic field is an optional field in Assignment and Lesson Plan items windows, holding up to 150 characters. A Topic is a short description of the material covered in the lesson. It can be the title of a Lesson or Chapter, it can summarize the contents of a lesson, etc. The Topic field can be displayed or hidden on any grid using the Options: Choose Columns menu. A Topic can be edited in the Multi-Edit window for any grid in which it appears. When included in the Daily Task List Report, Topics give your student an insight into the subject matter to be covered in the day's lessons. Topics allow you to show some detail of what was studied in each discipline using the Scope & Sequence - Assignments Report and Scope & Sequence - Lesson Plan Report. The Topic field is optional and can be enabled and disabled via Program Options in the HSTOnline menu. By default, the Topic field is enabled. Click or touch the box next to Topic to add a checkmark to enable the field; or to remove a checkmark to disable the field. When the Topic field is enabled, you can choose whether to display or hide the column in the Agenda - List View and/or Lesson Plan pages. 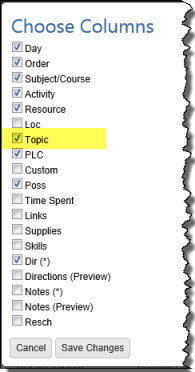 Click or touch the checkbox next to Topic to add a checkmark to display the column; or to remove a checkmark to hide the column. Topics are a free-text entry of up to 150 characters and can be added to Assignments and Lesson Plan items. 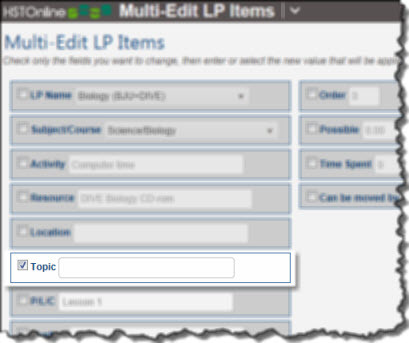 You can enter your Topics for each item individually, or use the multi-edit feature to enter the same Topic for two or more items at the same time. Please see the associated Help Pages for step by step instructions.